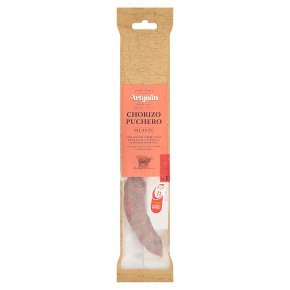 This Spanish chorizo may be small but it packs a flavoursome punch. Great to snack on with a drink, or add it to tapas.Chorizo Puchero is made in the La Rioja region in Northern Spain. They rear their own pigs and combine with only three other ingredients. The Puchero is then hung to mature. The Duroc Cross bree pig, which is larger and has deeper flavour when cured, is then combine with paprika to give a flavoursome punch. This handy size is ideal to be added in to any dish to add some flavour, but also works well on a salad or in tapas.